Yesterday I had the pleasure of visiting Longwood Gardens, just up the road in nearby Kennett Square, Pennsylvania. 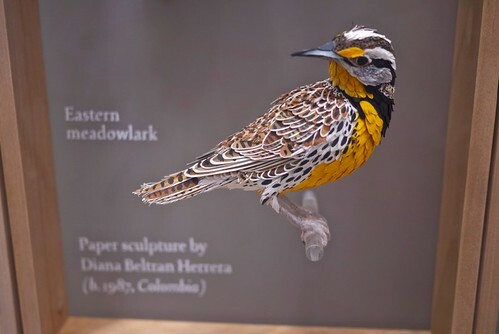 Not only was the weather fantastic - summer's last gasp - but I'd been looking forward to seeing Diana Beltran Herrera's paper birds that are on permanent display in the newly restored Webb Farmhouse & Galleries. Diana was commissioned by Longwood and Gecko Group to create six sculptured representations that live in the meadow habitat where the farmhouse is located. Golden painted edging glistens on the goldfinch's feathers. Many people stopped to look at the life-size birds, but I have a feeling casual observers didn't realize they are actually made of paper... the painted feathers, sharp beaks, and clawed feet are so realistic one might think he/she is looking at taxidermy specimens, although the paper sculptures are labeled as such at the bottom of the case. Not only are Diana's birds superb, but so are the photographs of each one that she posts on her website. Her ability to transform bits of painted and fringed Canson paper into three dimensional, life-like creations has been featured widely online. 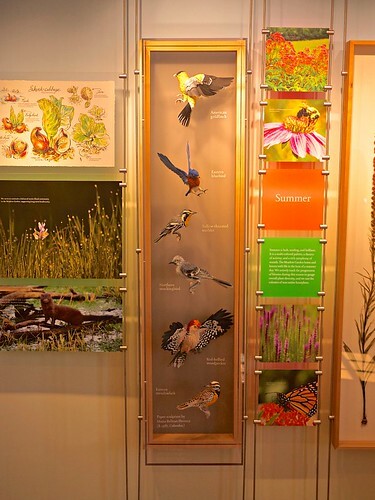 To give you an idea of the time Diana spends on each bird, a feature on Smithsonian mentions that the construction of a cardinal "might translate to just over six sheets of paper and five days of labor." "An eagle or a crane, on the other hand, means 10 to 15 sheets of paper and up to two weeks of time. 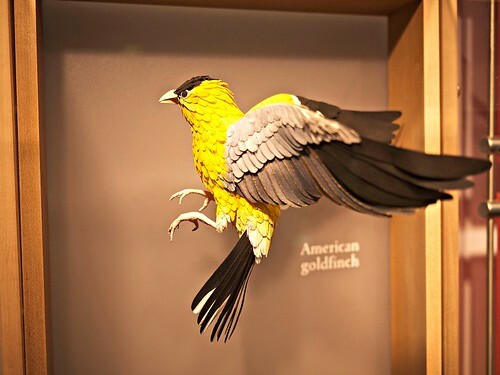 She observes some of the species in the wild, studies photographs of birds, and confers with ornithologists and birding groups to ensure an impressive level of visual accuracy." 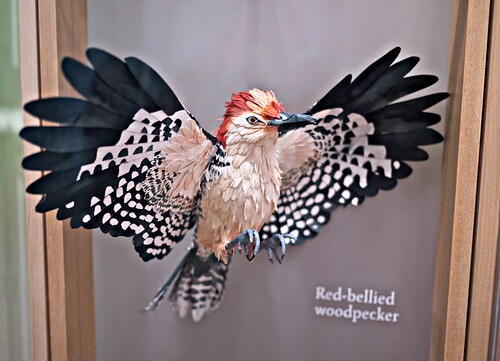 Diana builds an armature of paper strips, then covers it with feathers that she paints with watercolor inks. Only the birds' legs have a wire base. 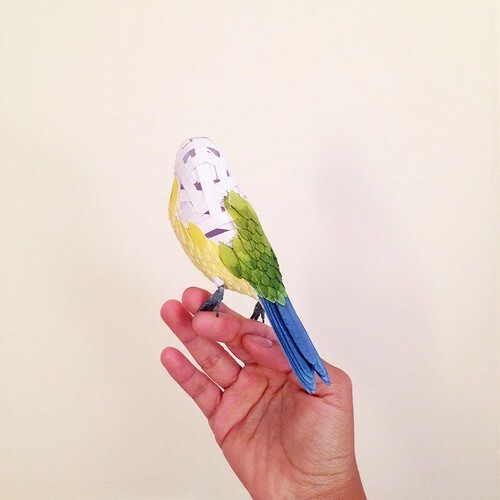 Diana, a native of Colombia, is currently studying for a Master's degree in Fine Arts at UWE (University of the West of England) in Bristol and works on paper sculpture in her spare time. 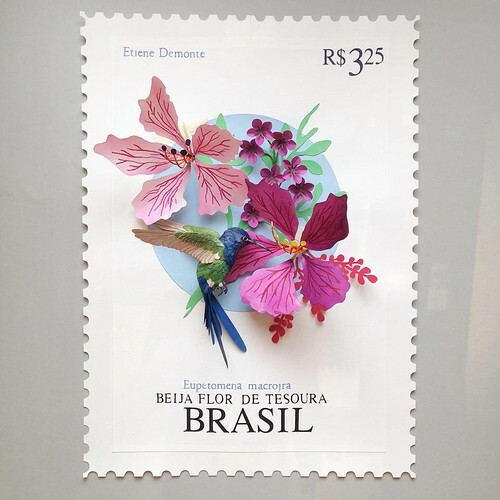 Since June, she has enlisted the help of Facebook fans to send her bird postage stamps from various countries. 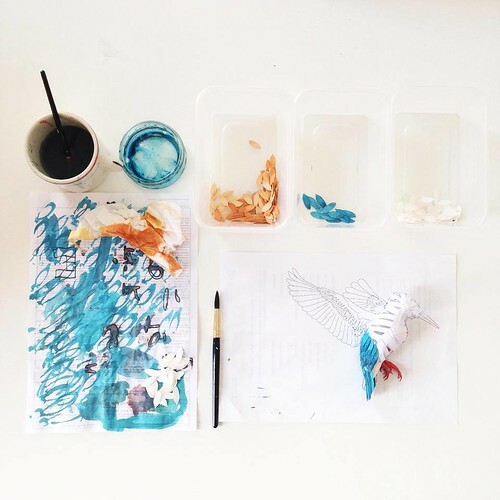 She is referencing the images to create bird and flower sculptures for an exhibit that will take place in Jakarta, Indonesia at the end of November. Stay up-to-date with Diana's latest work and exhibits via her website or Facebook. Oh me too, Molly, thanks. I feel lucky that Longwood is close by. Outstanding! Thank you for sharing these paper sculptures. Nice! Longwood is such a treasure. Fabulous!! They do look so realistic, I recently liked her page and I am a fan.